Capital City Grace Church was started by four families in 2009 with a focus on worshiping in and serving downtown Columbus. Larry Totzke and Eric Miller served as Co-Pastors during this time. In the spring of 2014 Larry Totzke passed the leadership baton to Eric Miller as Lead Pastor, and Larry and his wife, Sylvia, retired to Portland, Oregon. Began Worship Services in Westgate in 2018. Since the church has never had a building of it’s own it was easy to move the worship location to Westgate. We currently hold our worship service in Eric and Julie’s home with the plan being as we grow the church would hold our service in a rental property or own a space. We are not a brand new church, since we were downtown for a few years. However, just like a person moving into a neighborhood, we are moving our worship service into the Westgate/Hilltop neighborhood. So we as a church are new to this neighborhood. The Miller’s moved to Westgate in early 2017 and fell in love with it right away. It was only after moving here did it cross their minds to move the church to the neighborhood as well. Eric & Julie Miller with their sons, Jaden and Mayson. 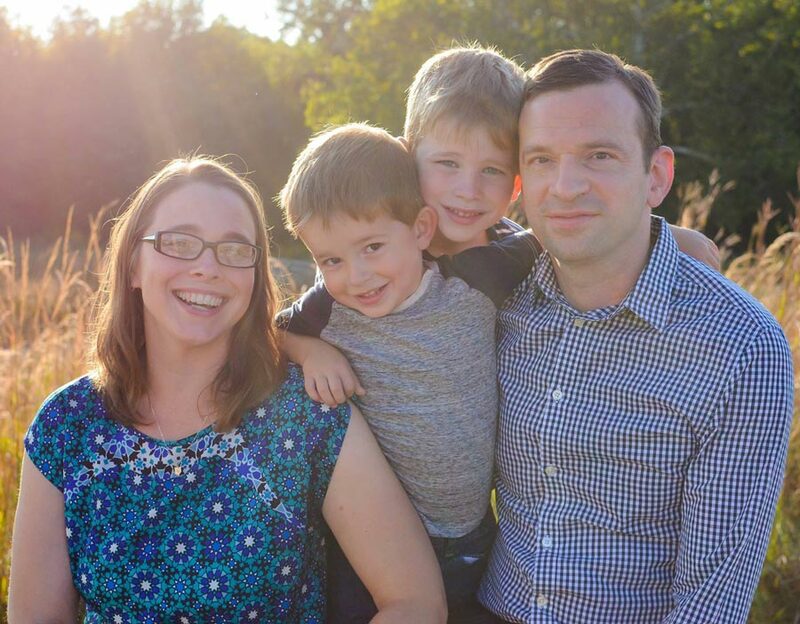 Eric and Julie Miller, both native Ohioans, got married in 2006 and moved from Wooster, Ohio to Columbus in 2008 to help start Capital City Grace. Eric is a graduate of Moody Bible Institute and is also a web and graphic designer with his company The Design Refinery. Julie has a Master of Social Work degree from The Ohio State University and worked at Communities in Schools, helping with families who are at risk of becoming homeless. She now serves as Capital City Grace’s Children’s Ministry director and is a stay-at-home mom with their sons Jaden and Mayson. She also enjoys writing about what to do with your kids in Columbus on her blog What Should We Do Today?